The Edible Agriculture Tour is headed for Savannah. 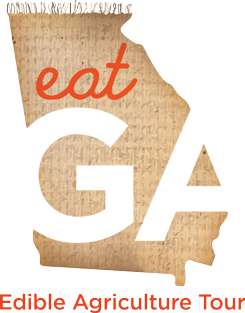 Join us on Tuesday, June 17 for EAT GA at Soho South Cafe. Enjoy an exclusive multi-course meal showcasing Georgia's freshest flavors prepared by Savannah's best chefs. A native of Roxboro, North Carolina, Chef Williamson grew up cooking beside her mother who helped cultivate a passion for food. She earned her bachelor's degree in Business Management from North Carolina State University before attending culinary school at Le Cordon Bleu in Orlando, Florida. Chef Williamson graduated from culinary school in 2005 and quickly refined her skills in fine dining. After working as Chef de Cuisine for three years, she was hired as Executive Chef at Local 11ten in June 2010. Williamson is committed to excellence and is focused on bringing innovative influences to traditional Southern Cuisine. Born and raised in Savannah, Jacob is very comfortable with coastal cuisine. Building his skills in kitchens ever since he was old enough to hold a knife, Jacob's work ethic sets him apart from most other local chefs. After earning a BS in Psychology from Armstrong Atlantic University, Jacob dedicated himself to Savannah's upscale dining scene, training under some of Savannah's best chefs. Jacob's love for French cuisine inspires him never to stop progressing. After joining the Local 11ten kitchen as Sous chef in September 2012, Jacob was promoted to Chef de Cuisine in June 2013. Born in High Point N.C., Brian received his culinary degree and quickly began his internship at one of the most influential restaurants in the state, Nobles. Here he learned the importance of sourcing local and seasonal ingredients to obtain the highest level of quality and freshness. His creativity and passion for the art of fine dining quickly became evident to his mentors, and after only four short years, with constant menu adaptation, he secured his position as Executive Chef. In 2007, Brian relocated to Savannah and continued to learn and make his name in downtown's most intimate settings. Brian was hired to open the Public Kitchen and Bar in July of 2012. He is dedicated to the Daniel Reed Hospitality team, and continues to push the envelope to make innovative and affordable dishes that are both French inspired and Southern staples. Chef Ouimet graduated with a BS in Hotel, Restaurant and Tourism Administration from The University of South Carolina. After working as front of the house manager for 2 years he enrolled in Johnson and Wales University in Vail, Colorado where he earned his Associates in Culinary Arts. His journey in the industry took him back to his native New Jersey, then onto Florida and finally Georgia working in freestanding restaurants, private clubs and world renowned resorts. His time spent at Sea Island exposed him to multiple cuisines and expert tutelage under renowned Chefs. Since opening Purple Sage Catering in 2005, he was able to expand on these experiences and showcase his work for the locals and visitors alike. Adam Turoni is the founder and owner of Chocolat by Adam Turoni. Known for his artisan, hand-crafted chocolates, 24 year-old Chef Adam Turoni, is a class of 2009 graduate of the Culinary Institute of America in New York. At the age of 14 he got his first job working in a kitchen, by the age of 17 he was the pastry chef of Isabella restaurant in Wilkes-Barre, PA. He interned for 6 months at Alice Water's restaurant Chez Panisse in Berkeley, California and assisted Chef Greweling with research and recipes as he worked on his third book: "Chocolates and Confections: Formula, Theory, and Technique for the Artisan Confectioner Second Edition(2013)". Since opening a wholesale space in 2010, Chocolat by Adam Turoni, chocolatier Adam Turoni has been featured on Paula Deen's TV show, SouthernLiving Magazine and various local publications and television appearances. Being born and raised in South Georgia, I was lucky to grow up around fresh produce and wild game. This really started my interest in food and cooking. Watermelon, butterbeans, okra, tomatoes, squash, cabbage, various greens and assorted peppers, just to name a few. I truly enjoyed cooking with my mom and grandmothers. They were a huge inspiration and laid the ground work to get where I am today! Some years later, after working in various restaurants and pubs in Athens, I moved back home and had my first chef position in a small place called Walter T's. I then took my interests to Charleston, SC where I attended culinary school at Johnson and Wales University. I graduated with double associates in culinary arts and food and beverage management in 2001. I worked in some of the finest restaurants in Charleston. After five years, I received a job offer as Executive Chef in Savannah at Vic's on the River. I opened Vic's and gave three years of blood sweat and tears. With the help of NLAWS produce, I was able to make Vic's a big success. After almost 20 years in kitchens I wanted to see what it was like on the other side so I took on a position as sales manager for NLAWS produce and haven't looked back. The ease of schedule allows me to do keep my feet wet by doing events like this. Hope you enjoy! Our family-owned cows are treated like they are supposed to be treated: out on grass, free to run around and enjoy nature as intended. We don't order up back massages and spa treatments, but we do pay attention to their moods and we know when something is amiss. We treat our animals like we would treat members of our family, because to us they are. Georgia Buffalo, Inc. is a family owned and operated bison ranch located on the beautiful southeast coast of Georgia, in the town of Townsend. Georgia Buffalo, Inc. is dedicated to the re-birth and restoration of the American Buffalo population to the nations landscape; we respect and strive to help conserve the natural and cultural heritage of bison. It is Georgia Buffalo's goal to provide customers with a healthy selection of high quality, all-natural and hormone free bison. 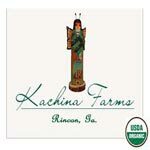 Kachina farms is a family owned USDA Certified Organic farm. 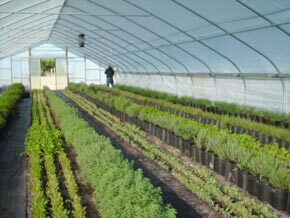 We specialize in growing herbs and produce for restaurants and those who love to cook. Fresh cut ingredients allow cooks to reduce salt and fat without sacrificing taste during cooking.